The original version (1.x) was picked up by a couple of people who expected guns and paint splattering action. Naturally they were disappointed. For those people (but not just for them) Paintball is now "enhanced" with a new option, Paint Mode, which allows you to switch from the bouncing balls to... splattering paint. -Image(s): choose which image you want painted. * Load - lets you pick images from your own collection. Supported filetypes are BMP and JPG. The saver will pick a random image from your list. When you create a list of your own images you have the option to stretch the images to fill the screen or scale them and add black margins. 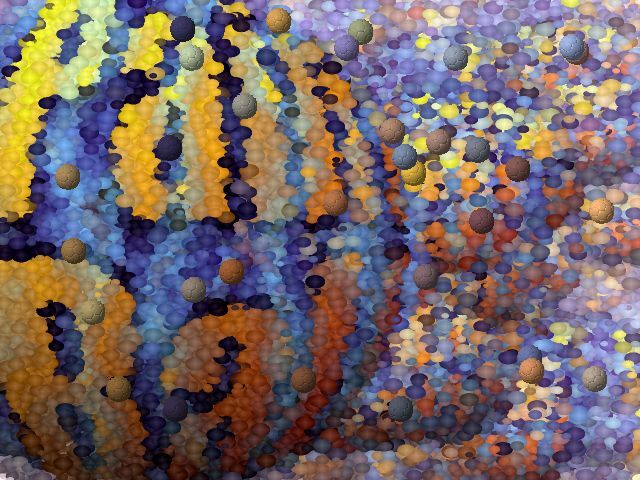 Bounce - the picture is painted by the traditional bouncing balls. Splat! - the picture is painted by blots of coloured "paint". Random - randomly picks one of the two modes. -Size of spots (or blots): Each time a ball bounces it will leave a coloured spot. You can set the size of the spot to influence the appearance of the 'painting'. -Speed: You can choose from slow to turbo. A high number of balls can slow the saver down, so turbo may not run as fast as you'd expect. High speed, with a lot of large balls will eat a lot of CPU cycles. -Time per image: After a certain time Paintball decides the picture is finished and starts on a new painting. With this option you can set the time the screensaver will keep displaying a single picture. -Wipe canvas: Decides wether Paintball starts a new painting on a clean canvas or paints over the previous picture.